A small to medium sized shrub, Psychotria poeppigiana has one of the more unusual flowers. It earns itself the common name of ‘Hot Lips’, and it supposedly has medicinal uses. This is a tropical to sub tropical plant and is from central America. It grows naturally in damp tropical rainforests and seems to prefer poor soils. The flowers are held above the foliage on tall stems. The red ‘Lips’ are the flower bract which surround the small flowers. The red bracts attract the pollinators which are hummingbirds. The flowers are followed by small purple berries which contain the seeds. Propagation is from cuttings as well as from seeds although the seeds are reputed to be slow and difficult to germinate. Despite its common names, to us it looks like a very bad Botox job, so watch out. It comes from South America through to Mexico in the highland Cloud Forests. Wet soils and high humidity are the main requirements for growing this unusual plant. Propagation from seed is possible, however germination is very slow. 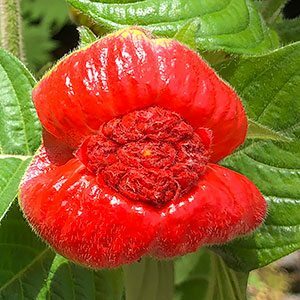 Common Names – Hot lips, The Sore-mouth bush, Botox gone wrong. Height – To 3 metres plus, often shorter. Spread – To 1 metre. Flowers – Surrounded by brilliant glossy red bracts.